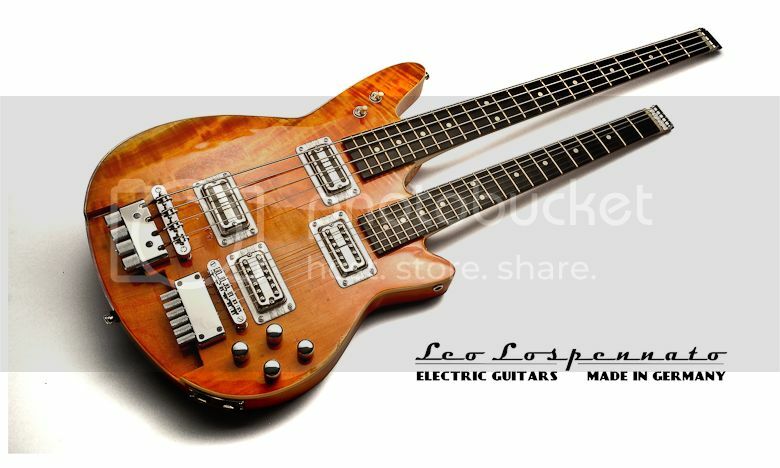 This is a one-of-a-kind Custom Triple-neck guitar was specially built by New York Luthier Sam Koontz between 1965 and 1967. 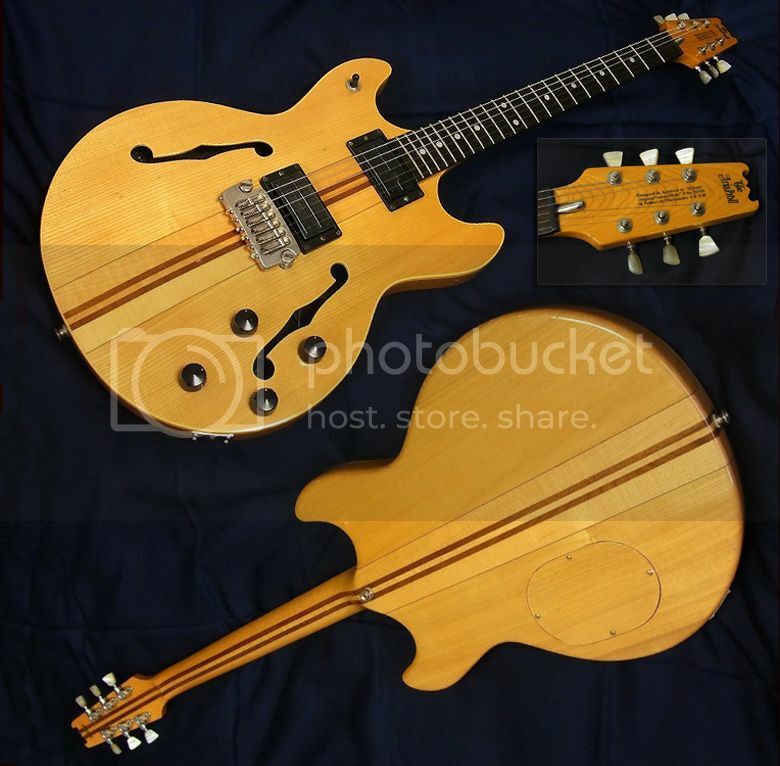 Unique triple-cutaway, multi-bound flamed maple, chambered body with 'Florentine' cutaways measuring 19.50 inches in width and just under 1 3/4 inches in thickness. This 'monster' guitar weighs a healthy 19.20 lbs (definitely not for a six-stone weakling) and has three (bolt-on) one-piece mahogany necks. All three necks have individual Grover 'Rotomatic' tuners with kidney-shaped metal buttons. The three headstocks are all multi-bound with black laminate faces. The six-string guitar (in the center) has "Koontz" and a nine-piece decoration all inlaid in mother-of-pearl. The twelve-string and the six-string bass necks just feature the nine-piece decoration. All three necks have 'dome' shaped black plastic truss-rod covers, each with two screws. Each neck is secured by four screws. The six-string neck has a nut width of just under 1 5/8 inches and a medium-to-thick profile. The twelve-string neck has a nut width of 1 13/16 inches and a medium-to-thick profile. The six-string bass neck has a nut width of just under 1 15/16 inches and again a medium-to-thick profile. Each of the necks has a bound ebony fretboard with pearl 'split-block' position markers. The six and the twelve-string have a 'zero' + 20 jumbo frets and a scale length of 24 3/4 inches. 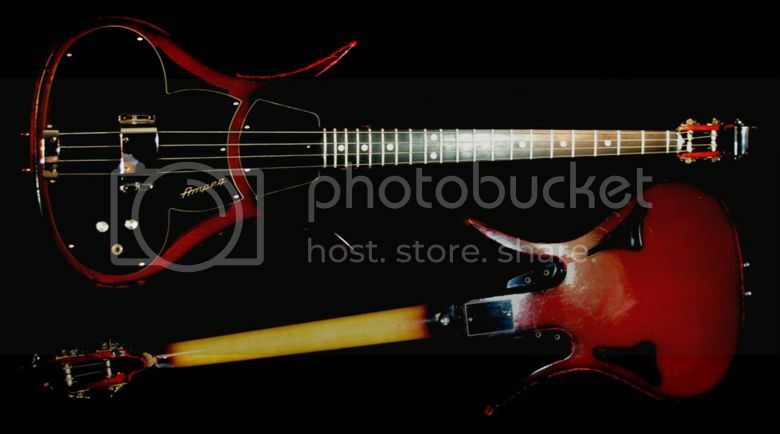 The six-string bass has a 'zero' + 15 jumbo frets and a scale length of 34.00 inches. Each neck has a specially wound Koontz pickup in the neck position. The six and twelve string pickups with six individual pole-pieces, the six-string bass pickup with a single 'blade' bar. Six controls (three volume and three tone) all mounted on a metal plate behind the Bigsby tailpiece on the six-string guitar. 'Rickenbacker' style seven-sided black plastic control knobs with plain metal tops. Three-way neck selector switch mounted between the six-string and the six-string bass. Three-way 'bass-boost' switch on the six-string bass. Two separate four-layer tortoiseshell over white plastic pickguards, each secured by two screws. All three guitars have specific Koontz bridges with individually adjustable metal saddles and metal covers. 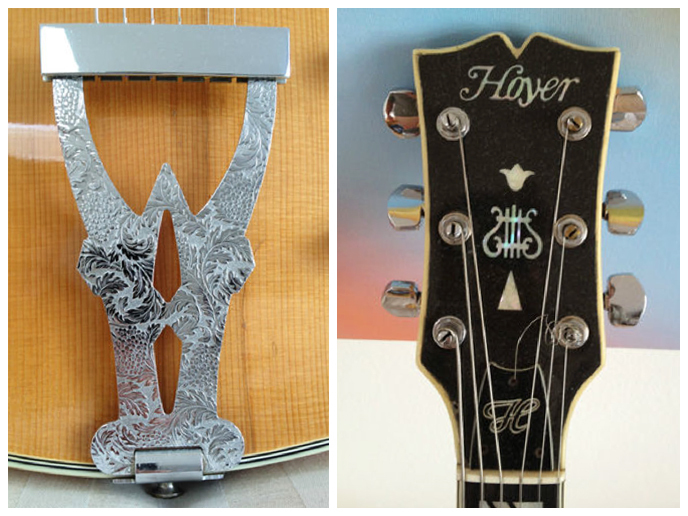 The six-string guitar (in the center) has a 'Horseshoe' style Bigsby vibrato tailpiece unit. 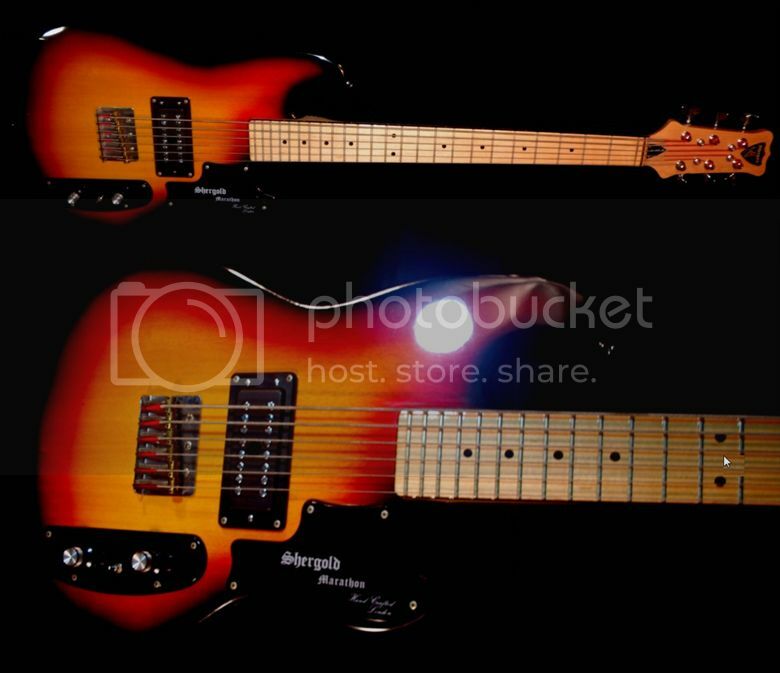 The six-string bass and the twelve string guitar have specific metal fixed tailpieces, each secured by five screws and each with a metal cover (secured by four screws). There are some areas of wear on the body, especially on the back of the six-string where there is a fairly large area of surface loss. There are also some small areas of surface loss on the sides of the body. 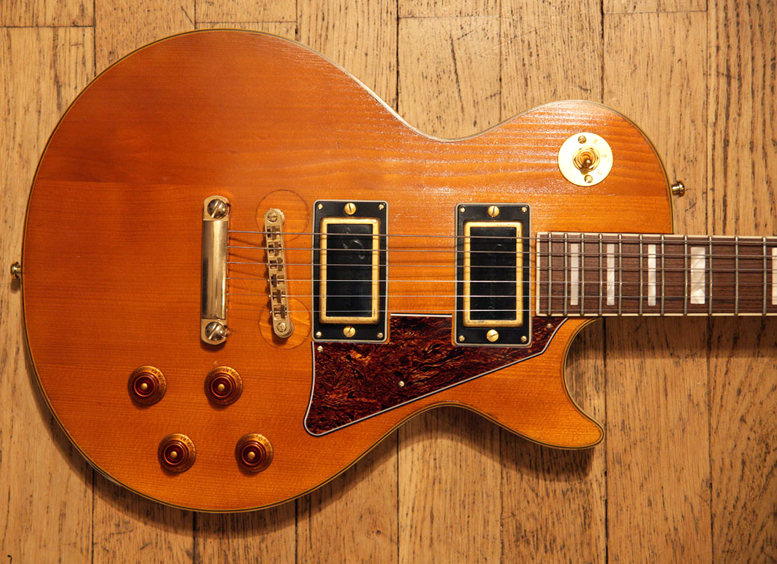 The top and back of the body are a wonderful three-tone sunburst with quite dazzling 'flame'. 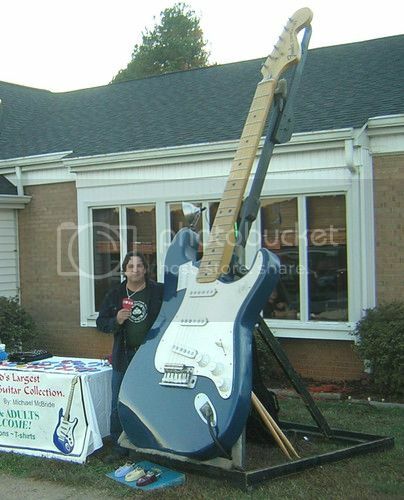 I have to wonder, who would ever need such a guitar? The only realistic scenario would be when one person needs to perform a song which requires them to play 6-string guitar, 12-string guitar and bass VI all within the same song. I can't imagine that scenario arises very often, and would probably require a song to be especially written for the instrument. Nevertheless, it's an interesting beastie and worthy of inclusion here on Guitarz. It could be yours for $13,500 via Vintage & Rare. 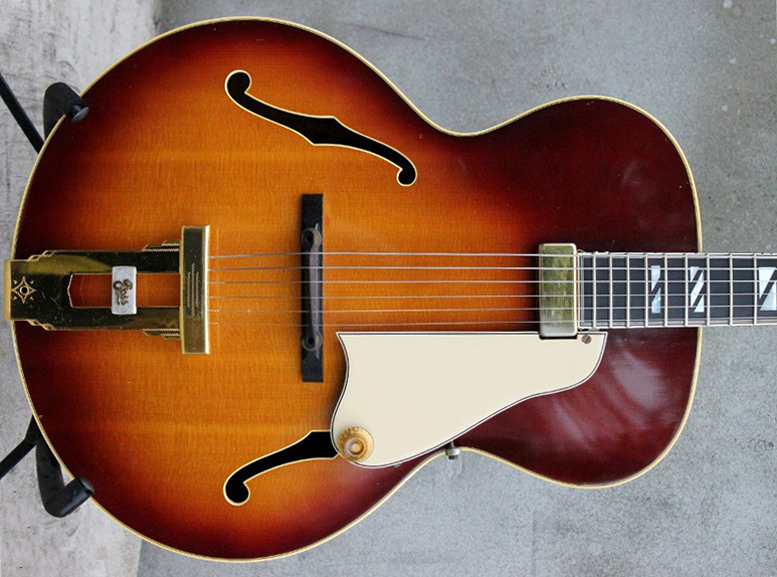 You know by now how fond I am of semi-hollow archtop guitars with double florentine cutaway, such as this beautiful Hoyer. I don't understand why this design is not more successful - or maybe it is its rarity that makes it so attractive! How I arrived at the body shape: yes, it was partly based on ergonomics. I took some inspiration from Klein and Teuffel, which I would guess were in turn partly inspired by the Breadwinner. I also sat down and studied how my Strat and Tele sat on my legs and which parts actually touched me when seated in the typical electric and classical guitar positions and how the locations of the strap buttons and body contours affected the position of everything when standing. Then I started messing with a picture of a Strat on my Macbook, warping it this way and that, squeezing certain parts, blowing up others, trying my best to guess how the total mass and distribution of weight would work in reality. (I didn't have the resources to go through multiple prototypes.) Everyone's bodies and arms are built differently, but at least for me the shape feels very comfortable in both the standard horizontal and diagonal/classical seated positions. I also had a theory that extending the overall length of the body and moving the center of gravity towards the tail without increasing the total volume might deepen the voice of the guitar a tad without making it heavier. Now that I have the prototype in my hands, I think it worked. Although to be honest it's hard to separate what's due to the body shape from what's due to that particular piece of alder. To my ears the bridge pickup has a nice bark to it, without the icepick highs that many don't like about Strat bridge pickups, the neck pickup has balanced highs and a good amount of tight bottom end without mud, and the in-between position sounds like your typical chimey Tele. I think it looks and sounds great - you can hear it for yourself in this soundclip. It is indeed a quality instrument, with the bulk of the build process being carried out by Glenn Sweetwood of Sweetwood Guitars on behalf of B-Way. The Mercury Head features Sweetwood's innovative 2-bolt neck system using machine thread connectors and allows for a greater contact area under pressure in the neck join, which means better tone transfer. 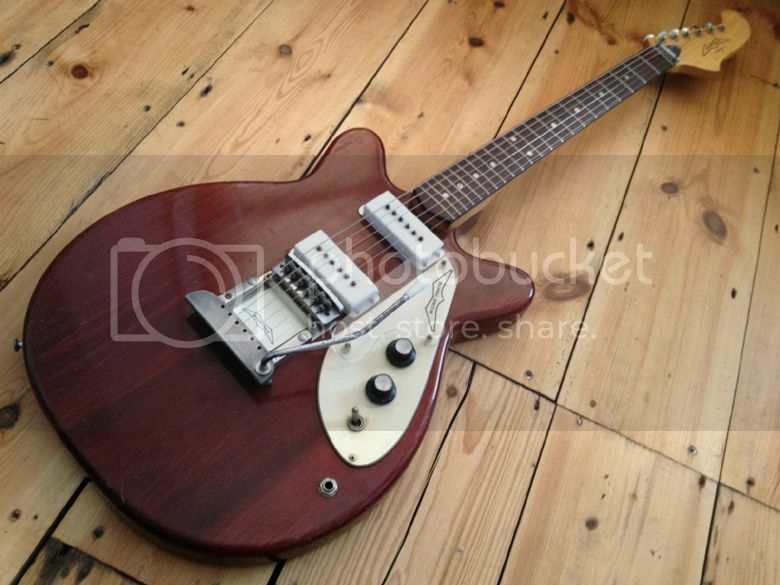 Thanks to Ben for getting in touch with us and showing us this interesting new guitar. Here at Guitarz we're always happy to support indpendent luthiers and small, non-corporate, guitar companies. Keep in touch, Ben, and let us know of any developments. With a starting price of €600, this silver sparkle Greco Mirage Bass with two split P-Bass style pickups is currently listed on eBay by a seller in France; which is interesting because it's quite unusual indeed to see these guitars outside of Japan. 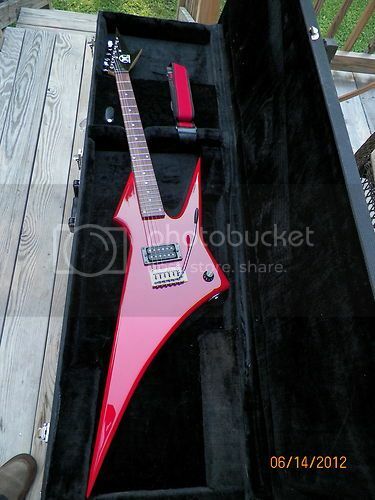 But I know what you're thinking... "Surely, it's a copy of an Ibanez Iceman?" Well, no, it isn't. 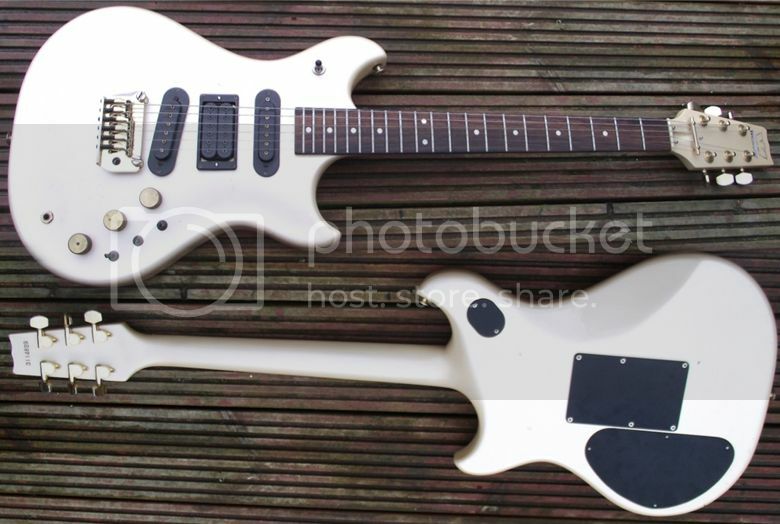 The Mirage/Iceman was designed in the mid 1970s by a committee consisting of Hoshino (Ibanez), Kanda Shokai (Greco) and leading Japanese guitar manufacturer FujiGen. 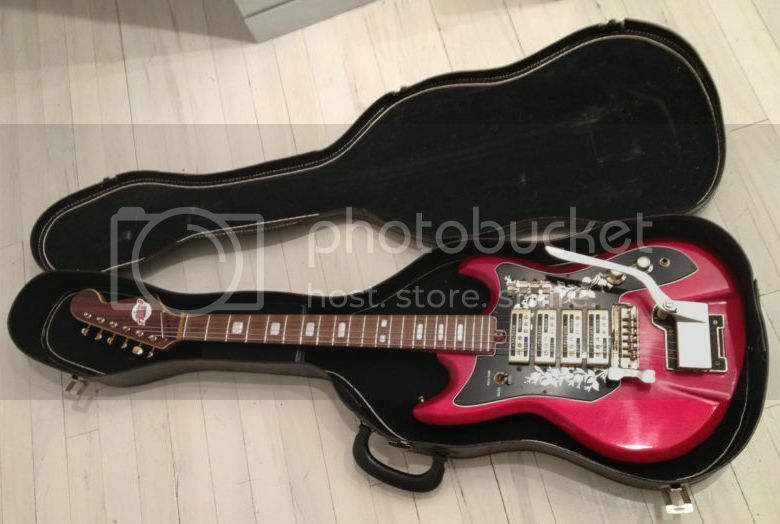 The resulting guitar was marketed by the different distribution companies in different global markets, and so the guitar we think of as the Ibanez Iceman was marketed outside of Japan, but within Japan the same guitar was marketed as the Greco Mirage. 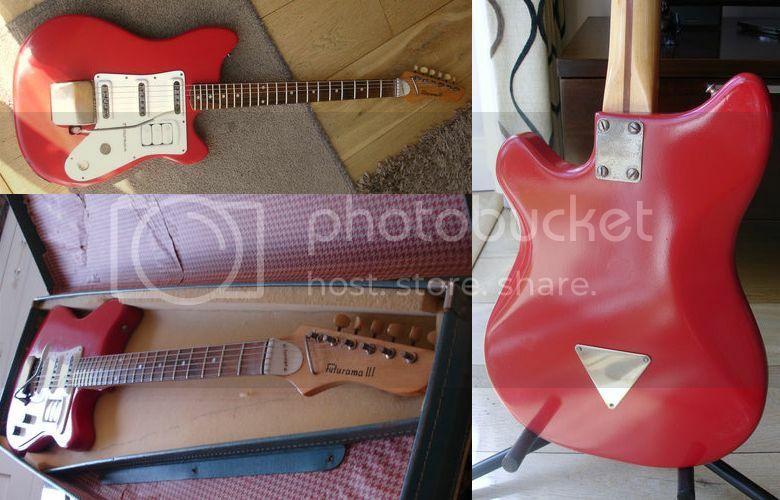 To confuse the story a little further, early Ibanez examples were known as the Ibanez Artist 2663, the name being changed to Iceman in 1978, so this guitar has legitimately appeared under three different guises none of which can be said to be a derivative of the other. 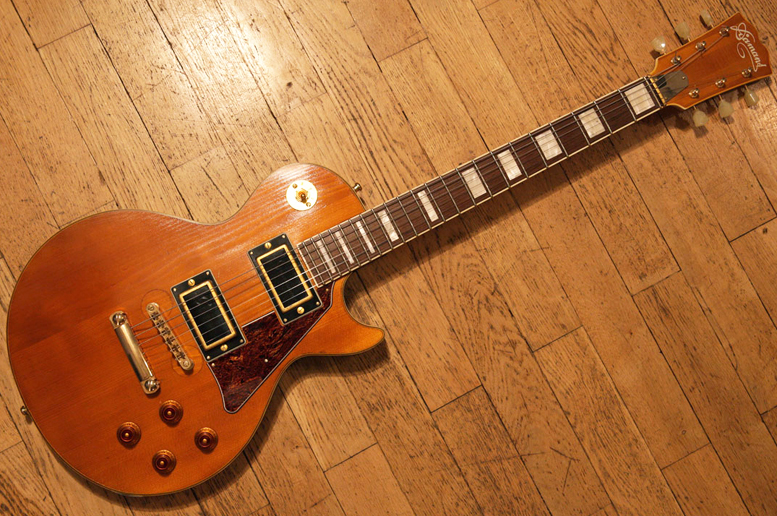 Sometimes it's good to just contemplate the most classic vintage electric guitar model, the Gibson L5 - here with a Johnny Smith replacement neck with beautiful inlays... My next guitar will be something like this (just 10 times cheaper)! Regarding Framus. I was stationed in West Germany in the late 50s and early 60s. 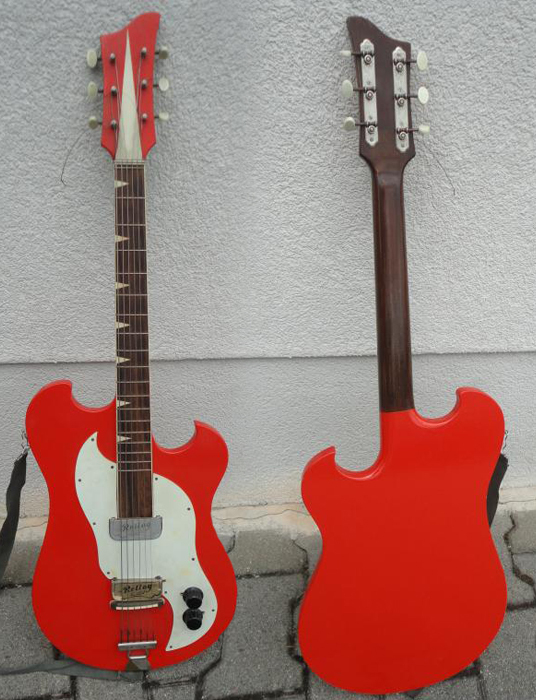 Came over with a beautiful Magnatone guitar [pictured right] and sold it to buy a Framus Hollywood solid body. It was an outstanding guitar. 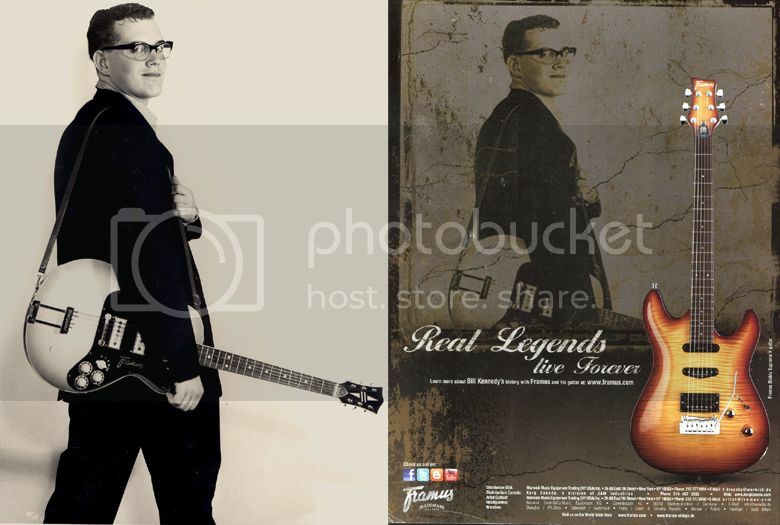 I sent a picture of me to Framus and they posted it on their vintage site. Also featured me in one of their advertisements. Check out the below sites. 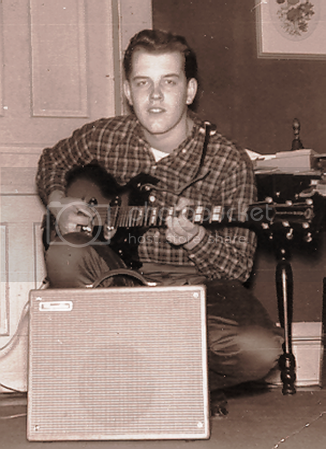 The unclebillmusic.com site has a lot about the guitars I’ve used. Hey Bill, thanks for those great photos and some nice links. 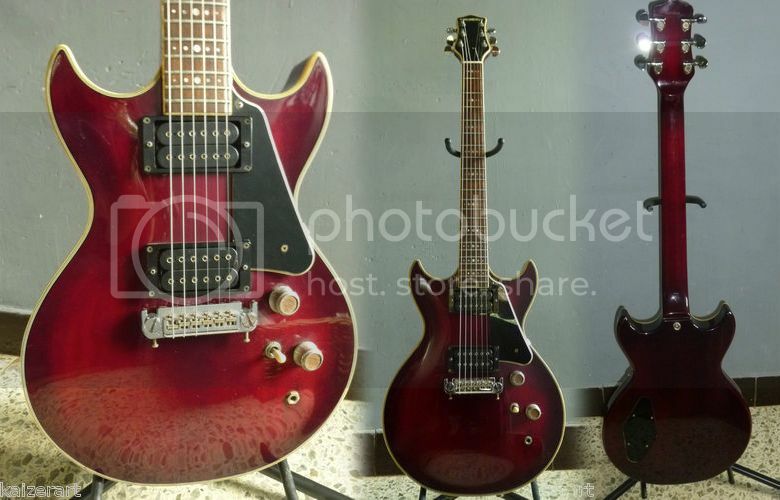 Whilst we're in a Framus state of mind, here's another Framus I'd like to show you, currently being offered for sale by Guitar Point in Germany and listed on Vintage & Rare. Again, I am not sure of the exact model. 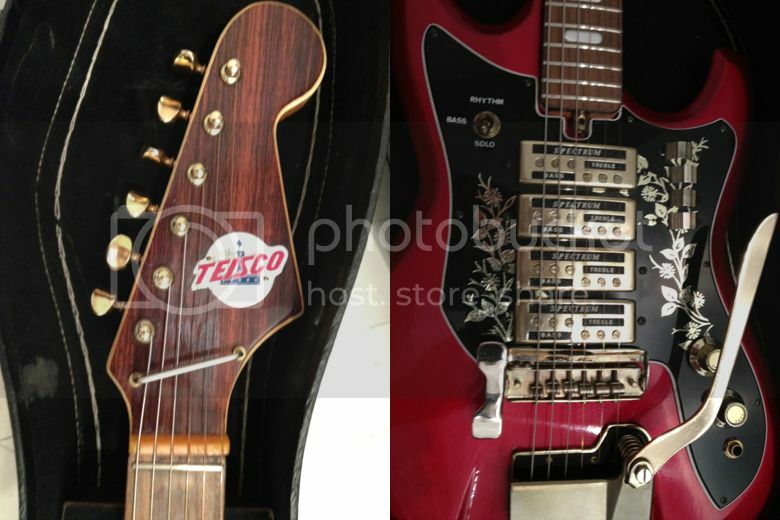 Its Jazzmaster-like styling is shared by several Framus Strato and Strato Star basses listed on the Framus Vintage Archive website, but they don't appear to have one with these pickups and pickguard. It's possibly just a variation of the Strato Bass. It's interesting also to note that Framus made a Jazzmaster-styled bass three decades before Fender (or rather Fender Japan) decided to produce such a model. 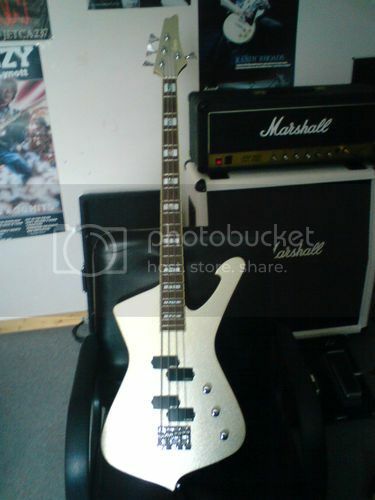 This particular 1974 bass in near mint condition is being offered for sale via Vintage & Rare priced at €675. 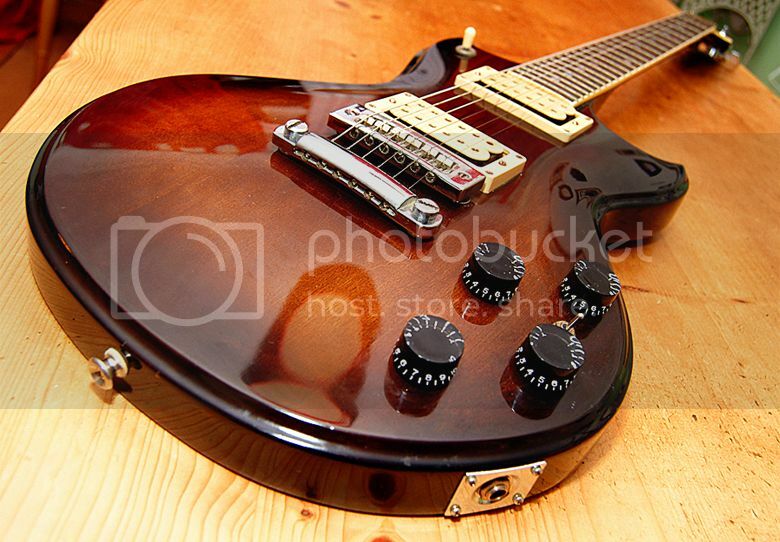 Although I believe I have quite a fair knowledge about guitars, the various brands and models, and also have the ability to retain tidbits of detail about various models, I have never claimed to be a guitar "expert" - and one of the things I love about compiling this blog is that if I don't know something I can throw the question out to the readership and, 9 times out of 10, get an answer. 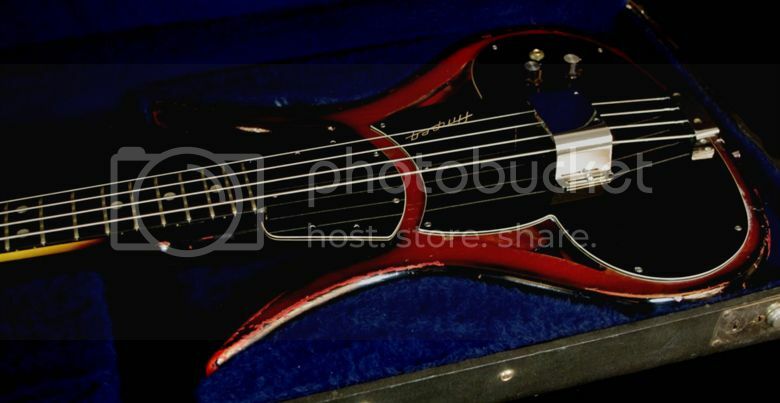 So, yesterday's mystery Framus is in fact an Atlantic 5/110. 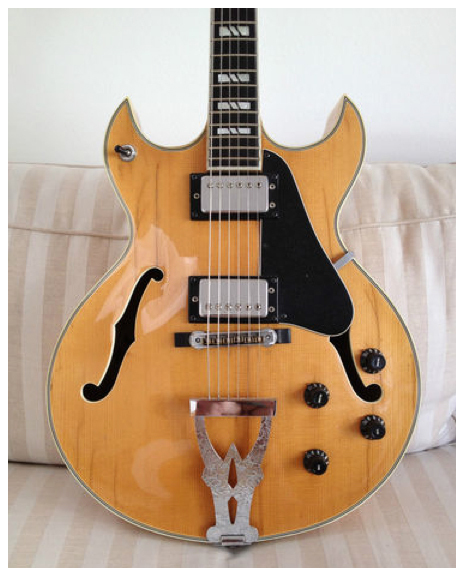 It WAS included on the Framus Vintage website but was filed under "Thinline" when I had (quite fairly, I think) been searching to no avail through the "Archtop" category. 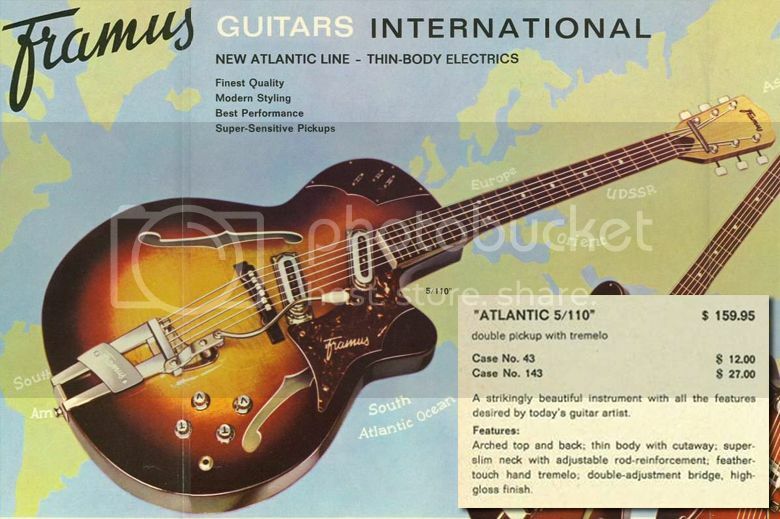 Thanks to David B for identifying this guitar and for sending the attached images from the 1965 Framus catalogue. Labels: archtop, cool guitars, Framus, German guitars, thinline, vintage guitars, What's that guitar? 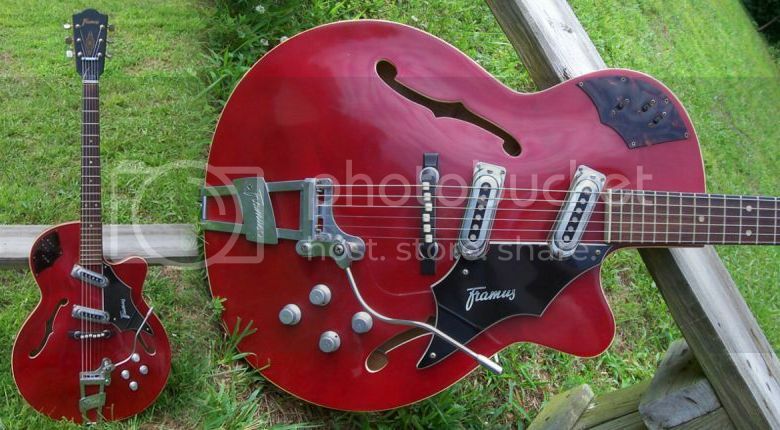 1960s Framus electric archtop on Craigs List, but any idea which model? Labels: archtop, cool guitars, Framus, German guitars, Semi Acoustic, semi-hollow body, thinline, vintage guitars, What's that guitar? It's funny how your perception changes over time. I remember thinking, back in the day when they were being produced, that Westone guitars were all rather ugly - although I would have been first to admit that they were "ugly ducklings" by which I mean that the quality of the build and the playability meant they were really quite elegant swans beneath the ugly duckling appearance. (Errmmm... perhaps, I've carried that metaphor a little too far). 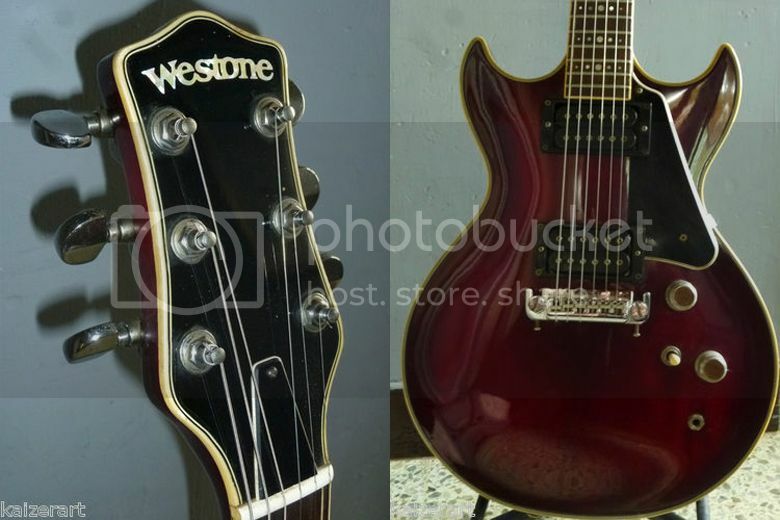 Anyway, back in 1983, this Westone Thunder III was the top of the Thunder range and features all maple construction, a very modern and comfortable heel-less set neck, and coil taps/phase reversal switches for the humbucker pickup, which is - unusually by present day standards - the middle pickup in a three-pickup S-H-S layout. 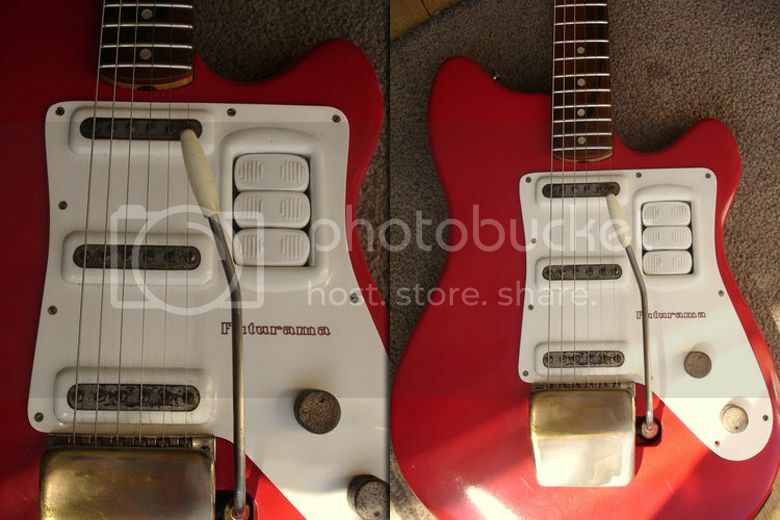 It's the kind of pickup layout that makes you question why so many modern guitar manufacturers stick rigidly to the same few tried and trusted ways of doing things and don't try anything different from the norm anymore. This guitar is currently listed on eBay UK with bidding currently just over £30 at the time of writing. 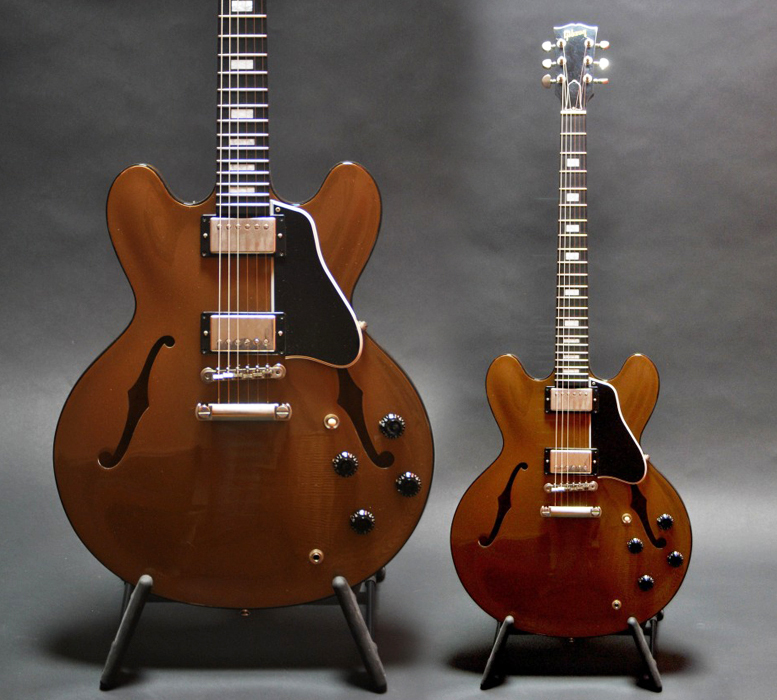 Japanese-made Westone guitars have more than kept their value over the last thirty years and examples often change hands these days for sums in excess of their original retail price in the 1980s. 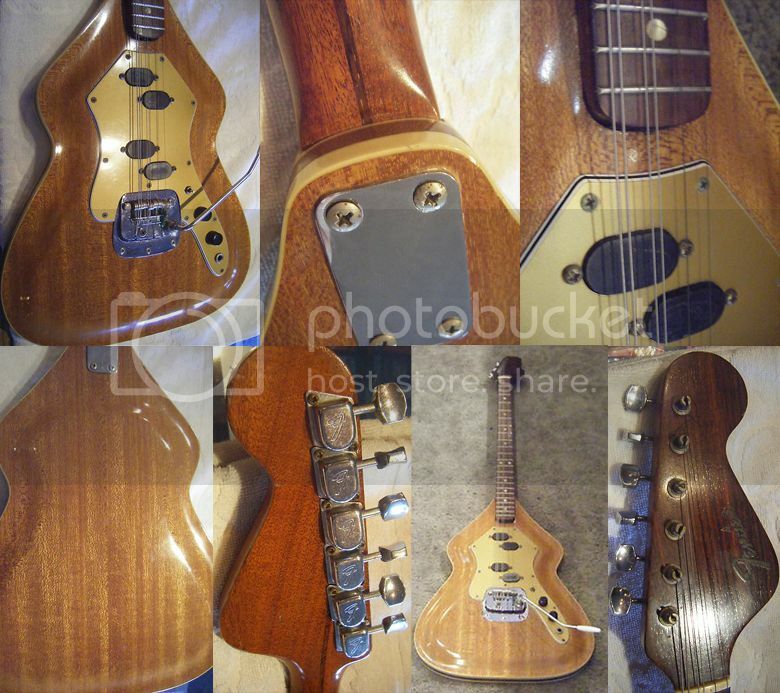 Micro-Frets guitars turn up very rarely on eBay, and even less so on eBay UK. This Micro-Frets Calibre I, circa the turn of the 1970s, is currently listed with a Buy It Now price of £750, which isn't bad at all for an American guitar of this vintage in good condition. The seller points out that a set-up to your own requirements may be needed, but hey, any new guitar out of the box needs a good set-up these days, so that's no biggie. And if you don't know why Micro-Frets were so innovative, I suggest you read a couple of blog posts from the archives, here and (perhaps even more pertinently) here. 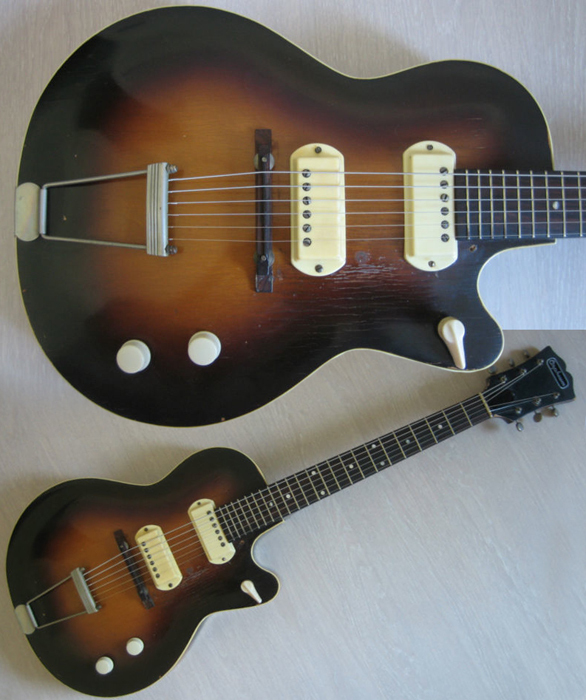 Kaizerart, the French seller of this Westone doublecut guitar from 1981 refers to it as being "70 Years" model, a reference that is lost on me. It's one of the earlier Japanese-made Westones from the 1980s, from before the better known models such as the Thunder, Concorde and Spectrum series. 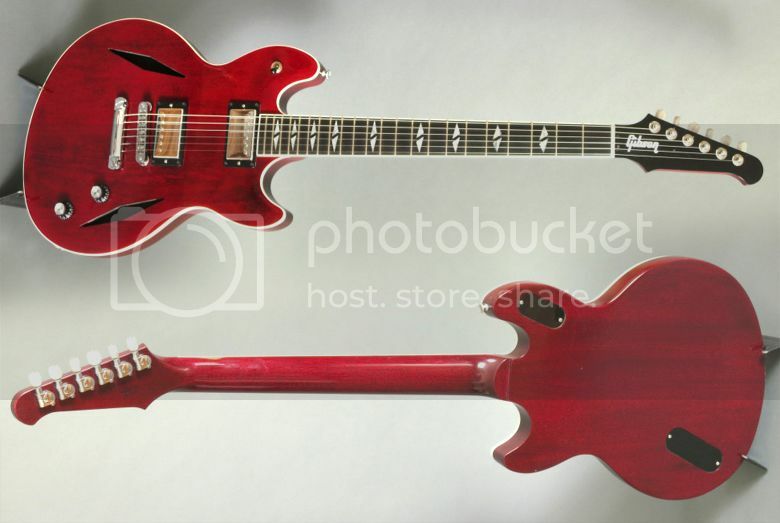 It's essentially a double cutaway Les Paul style guitar (albeit with simpler controls), with an arched top, set neck, and Bordeaux red finish. 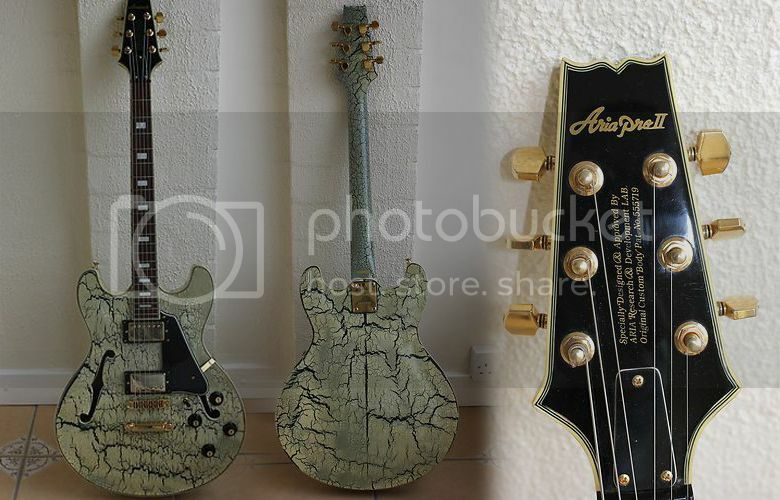 This guitar is currently being offered for sale on EBay France with over five days left for the auction to run and with bidding currently just over €50 at the time of writing. If anyone can explain the "70 Years" reference to me, please leave a note in the comments. While this may look like a pretty ordinary Fender Telecaster, albeit quite a nice vintage example with a naturally aged faded blonde finish, I'm sure by now you'll know that certain vintage Fender guitars can command some quite staggering prices. Indeed, all is not as it first seems, for if you remove the pickguard on this Tele, it's revealed to be a rare example of a "Smuggler's" Tele, so named because of the cavities in the body below the pickguard, in which - I'm sure you could imagine - it would conceivably be possible to hide contraband. 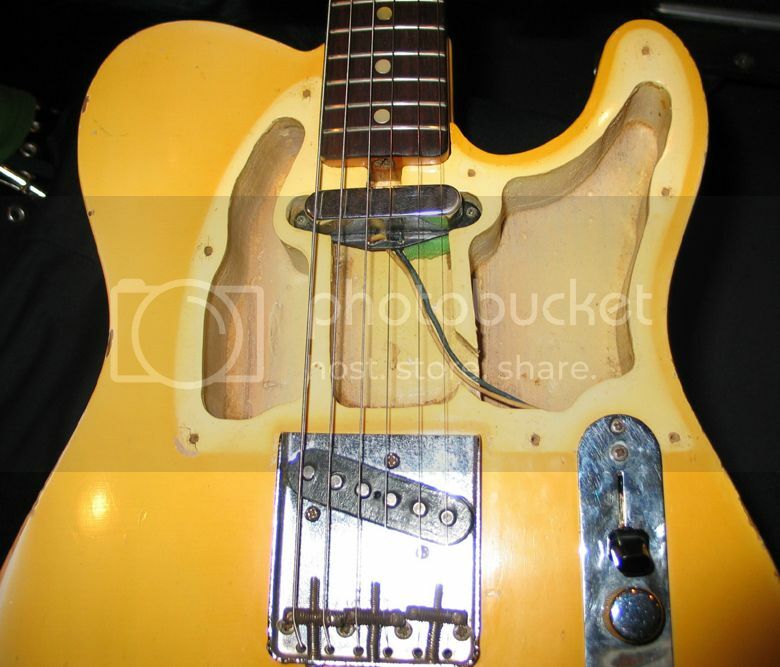 These cavities were intended to reduce weight in the guitar body; personally I've never found Teles particularly heavy and maybe the consensus of opinion was that the production of a slightly lighter than usual Telecaster didn't really warrant the extra machining on the body and so these "Smuggler's" were only produced briefly in 1967. 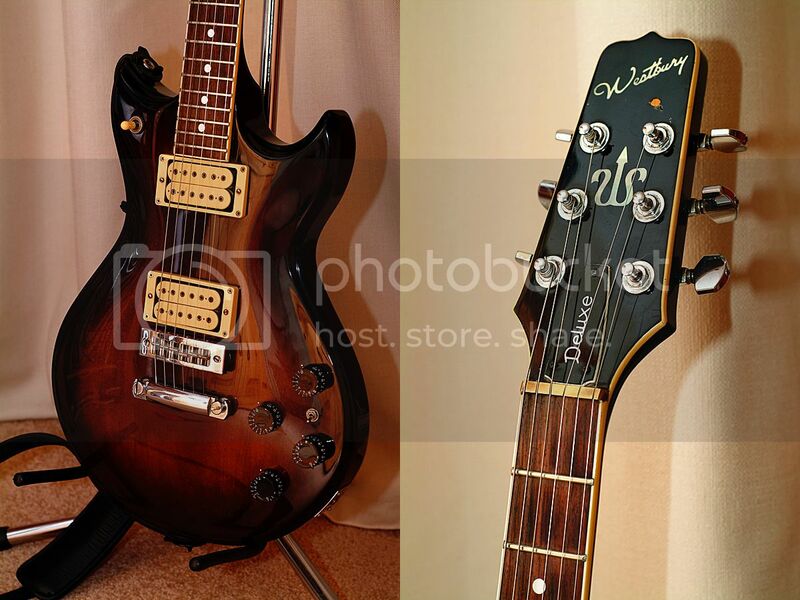 Currently listed on eBay, this guitar has a starting price of $9,995.